For WE KNEAD TO BAKE we had baked Focaccia Caprese. The focaccia was amazingly delicious and welcome. The wallpaper on my laptop is this focaccia and I dare not change it. With my site crash I lost a delicious and much in demand focaccia. So I decided that this April some of the yummy bakes I have lost will have to be remade again. So I am”Fire(ing) my Oven this April “to make this yum focaccia. Let me however confess that the pictures are all old the bread had disappeared before I could get the camera out.This is the only picture I have of the bread. Focaccia is a type of flatbread from Italy, thought to have originated in ancient Greece but now associated with Italy and baked in a variety of ways. Apparently the name Focaccia originates from the ancient Roman “PanisFocacius” which was originally a flatbread that was baked on the hearth. I have baked a Focaccia before and when I heard the name of this Focaccia which is Focaccia Caprese, I remembered the time when “Insalata Caprese" tempted me till I made it! "Caprese" refers to something that comes from or is in the style of Capri, an island off the Italian coast near Naples. Capri which is so famous for its villas, grottos and limestone towers and for the salad named after it “Insalata Caprese”. Focaccia Caprese is the basic Focaccia dough topped Caprese style, which is sliced tomatoes, mozzarella and basil, in addition to the usual olive oil and herbs that are typically used in this flatbread. Fresh mozzarella is recommended but for people like me who have no access to it make do with regular mozzarella that is used on Pizza. Mix and whisk all the ingredients in a bowl and set aside. Keep aside till required. The dough can be mixed and kneaded by hand or machine. If like me you are using active yeast in a small bowl stir in the yeast, all the sugar and ½ cup of warm water. Mix well and set aside in a warm place for 10 minutes or so till the mixture is all bubbly and frothy. Put the flour, salt and oil in a big bowl still well to mix all the ingredients. Add the yeast mixture and stir, mix well. Then add ½ cup of warm water (and as much more as you need) and knead until you have a soft elastic dough that is just short of sticky. Shape into a round and place in a well oiled bowl turning the dough around so it is coated. Cover with a napkin and let it rise till almost double in volume, this takes about an hour. Now, its decision time should you make 2 medium sized Focaccia or 4 smaller ones? For the rectangular Focaccia, take two rectangular pans/ jelly or Swiss roll pans and oil them well. Then divide the dough into two equal portions or 4 and lightly roll them (or press out) out into approximately 11” by 7” tins if you are e making 2 Focaccia or 5” by 7” if you are making 4. I am very happy when I am making a Focaccia as it does not mind being in an odd shape its rustic and does not understand symmetry. Transfer the dough to the baking tins. The dough will shrink a little. With your fingers push it out to the edges make sure it’s evenly thick throughout. Let it rise for 20 minutes. Lightly oil your finger tips and press into the dough creating evenly spaced “dimples” in it. Generously brush the surface with oil. Bake at 210C (410F) for about 18 to 20 minutes till it is almost done and is beginning to turn golden brown. Take the Focaccia out and turn up the heat of your oven to 230C (450F). Lightly drizzle some of the Herbed Oil over the Focaccia and then arrange some slices of mozzarella evenly over the bread avoid gaps between them the slices. Arrange the tomato slices over this and a little sprinkle the chopped basil over this. The topping should cover most of the bread surface. Drizzle some more Herbed Oil over the topping and return the bread to the oven. Bake the Focaccia for 5 to 8 minutes or until the cheese has just melted. Remove from the oven and garnish with fresh basil leaves. Cut the Focaccia into slices and serve while it is still hot. Enjoy your fragrant Focaccia straight as it is or with soup or a salad. we made this last year and it was sooo delicious... yours has come out very nice!! Remember baking this last year. We loved it. The toppings taste great on a focaccia. Your focaccia had turned out fabulous. This focaccia rocks and just love the beautiful slice, too irresistible. 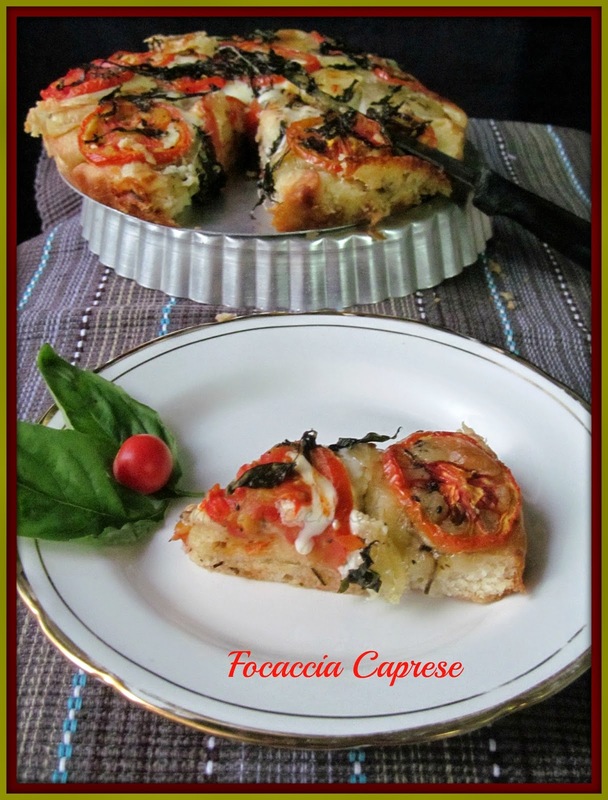 Nicely baked focaccia caprese,perfect with a bowl of soup for a comforting lunch or dinner.. This focaccia looks so colourful. I really need to try this..
What a soft & fluffy focaccia -- love the caprese topping -- very colorful and delicious. I love baking focaccia and the dough is just so beautiful to work with. The flavor are so awesome! On my to do list since a very very long time..the bread looks amazing ..and very inviting. I baked this too. Looks very inviting!! !